It is an early afternoon in the Austrian Alps. A wooden terrace of a mountain shelter is bathed in sunlight – the yellow umbrellas above the small tables look like daffodils’ flowers. Under each umbrella, a group of five or six people is discussing something animatedly. The tables they gather around are marked “Water Department”, “Public Health & Waste department”, “Infrastructure & Energy Department”, “Business department” and “Environment department”. There is also one additional table, moved a bit aside. 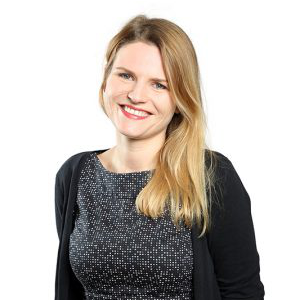 It is the Council, whose task is to consider the policy proposals that are brought to them by the department’ heads. From time to time a woman in black approaches each department, passing them a thick pile of documents. Upon her arrival, the group discussions become even more stormy. It means that a new problem or request has been submitted by the society. Departments’ heads are scanning the documents quickly, trying to prioritize issues the group has to address. The time is running, members of the groups seem to be far from reaching a consensus, and a stream of new issues is still flowing. Suddenly, a collective sigh of relief may be heard – the water department voted for a policy unanimously. The head of the department leaves to pass their proposal to the council. Just in time! Almost simultaneously, a moderator rings a bell and asks the buzzing crowd for attention. The moderator is standing next to the map of Bengaluru, and he has an important message to pass. The participants were invited here by the International Institute for Applied Systems Analysis and Centre for Systems Solutions as part of the meeting of the Alpbach-Laxenburg Group. The Alpbach-Laxenburg Group consists of the most renewable scientists, researchers, politicians, and business leaders from all over the world, interested in supporting global economic and social transformations towards sustainability by creating and communicating positive narratives for sustainable development and business opportunities, grounded in cutting edge international systems-science. Used to share their ideas at plenary discussions or seminars, today they were involved in a more engaging social simulation. Social simulation is a type of multiplayer serious game with direct interaction among participants. Like all serious games, its goes beyond entertaining functions and embraces such serious goals as transmitting important message, raising awareness, training practical skills or facilitating communication and understanding among the participants of different backgrounds and values. The “social” element of the game presupposes active engagement of the participants, who have to negotiate, dispute and ally with other players to achieve desirable outcomes. The word “simulation,” on the other hand, refers to yet another key aspect of the activity, that is its capacity to mirror real life challenges. Many social simulations are based on empirical data and address the key aspects of real problems. Will Bengaluru have to be evacuated soon? As might be expected, the flagship companies of the rich IT-branch are located in well-stocked city parts. Their managerial staff and qualified employees live in modern, separated from poverty and dirt, housing estates (gated communities), but the majority of the city population are poor employees of informal sector. They live in slums with unacceptable sanitation conditions, where the poverty gap increases year by year alongside the dissatisfaction of the society. Although Bengaluru has a lot of rain at certain times of the year, supplying its citizens with sufficient clean drinking water is difficult. There are no rivers nearby. The city used to rely mainly on wells and over 600 artificial lakes (established in 16th century). In 1971 the city started pumping water from the River Cauvery 100km from the city and 300m lower in elevation. The costly (each kilo-litre of water takes 1.88 units of electricity to transport) process is nowadays used to supply nearly 60% of the city’s demand for water. However, the forecasts are worrying as the river’s efficiency decreases year by year. What is more, an estimated 35%t of water meant for the city is wasted in leakages in pipe systems. The artificial lakes, meanwhile, are nowadays mostly converted into housing estates or other developments. What has complicated the situation is the falling groundwater table and low-rainfall being recorded in Kodagu, the river’s birthplace, because of reckless destruction of fragile ecology. The process of falling groundwater table is also visible at Bengaluru, where in 1990 the groundwater table was at 30 meter deep, while in 2015 it was at 300 m.
The limited drinking water access is resulting in further social inequalities and even in criminal acts, as water theft is a common practice in Bengaluru. Threat of criminal liability does not help, even after the BWSSB (Bangalore Water Supply and Sewerage Board) introduced a penalty of six months of jail for stealing water. Only in 2016 over 80,000 households were found to have drawn unauthorized connections from the pipeline network of Bangalore Water Supply and Sewerage Board, and this was only the tip of the iceberg, as there is no data about the amount of water that is illegally pumped from the wells. The sewerage network covers only 265 km2 of the city (around one third). Therefore it does not have the capacity to treat all sewage. Only 30% of the sewage is treated and the rest flows untreated into the existing lakes. The process of uncontrolled waste and illegal sewage dumping limits water access still further. Most of the lakes are nowadays contaminated, filled with domestic and industrial waste (the estimated sewage generated by the city is about 1400 millions of liters per day, the installed capacity of sewage treatment plants was in 2016 only 721 MLD). It all adds to the potable water scarcity, as most of the borewell water and tap water in Bengaluru is not potable anymore. The IT sector has created the problem of toxic e-waste in the city, the estimations showing a number of 20,000 tons of e-waste that is produced in Bengaluru each year. Although a formal recycling system for e-waste was set up, 90% of it is dealt with through the informal sector, which is harder to monitor. Unaware of the necessary safety measures, some incinerate the e-waste, releasing lead, mercury and other toxins into the air – and dump the rest, allowing pollutants to infiltrate the groundwater. This unprofessional waste disposal causes not only water contamination but also direct human hazard. Sometimes the level of contamination is so high that the water reservoirs are covered with froth which catches fire. The population density of Bengaluru increased by about 425% in just ten years thanks to growing opportunities. In 2017, there were 17,000 people per square kilometer, compared to 4,012 ten years before. Bengaluru is now growing faster than ever, crossing the 10-million mark in 2013. To satisfy the demand for housing, most of the Bangalore artificial lakes have got encroached (legally and illegally) and converted to developmental activities. The process of city growth and sprawling development encroached the natural areas causing their radical decrease. The disappearance of green areas dramatically reduces their positive impact on heat and air pollution in urban zone. Traffic and uncontrolled emission of industrial exhaust is the reason why Bengaluru was ranked 63rd among 168 cities for PM 2.5 levels in 2015-16 (air pollution), far below standards prescribed by the World Health Organization. All these problems have lead some scientists and researchers to conclude that the city of Bengaluru will become unlivable in a couple of years – with an alarming growth of built–up area, almost no potable water and the vegetation reduced to minimum, it will simply consume itself. Can social simulations help us understand global challenges better? The Bengaluru case offers an excellent example of a complex, multifaceted problem, whose understanding would require months or even years of extensive research and thorough analysis of variables and interconnections. Meanwhile, in case od Alpbach experience, the “players” had only an hour. What is more, rather than studying diagrams and facts, they got actively involved in the process of mock policy making. By assuming new roles of the city council and its different departments, they entered a simulated reality of a struggling city whose fate was left in their hands. An inflow of requests, petitions and letters from unsatisfied inhabitants reflected the multitude of overlapping and contradicting interests and needs the Bengaluru citizens really face. A division into rounds created additional tension, as the time pressure made the decision process even more hectic. From time to time, signs of frustration could be observed, as the effort put in diagnosing a situation, framing critical issues, developing relevant policies, and passing them through the legislative process did not bring desirable outcomes. The city was evolving according to participants decisions – the map of the city was constantly updated by the moderator. And although the participants did they best to address all the urgencies, new problems always appeared, covering the map with warning signs. It may seem from the above example that social simulations are designed to confront the participants with their incompetence or lack of strategic thinking. This is not the case. 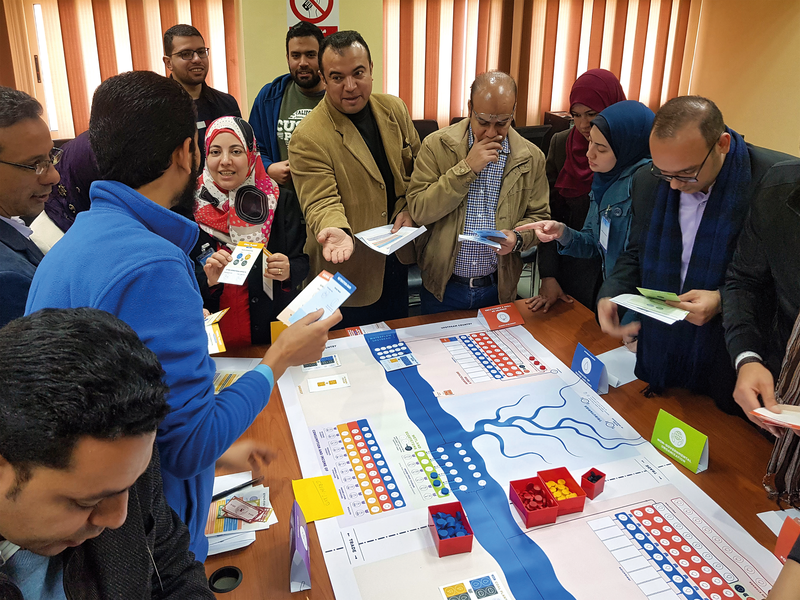 Social simulations throw participants in at the deep end to let them experience the complexity behind many global problems. Relying on a simple mechanism of cause-effect relation and the moderator’s instant feedback, the Bengaluru Quest finally helped the participants discover the underlying interconnections and perceive the country’s situation more holistically. Did they manage to secure the Bengaluru’s future in an hour? The answer is no. Yet, this was not the aim of the activity. Social simulations do not offer ready-made solutions to global problems. What they do is help people navigate the complexity behind such problems and to understand that an effective counteraction requires collaboration, smooth information flow, and ability to make trade-offs. 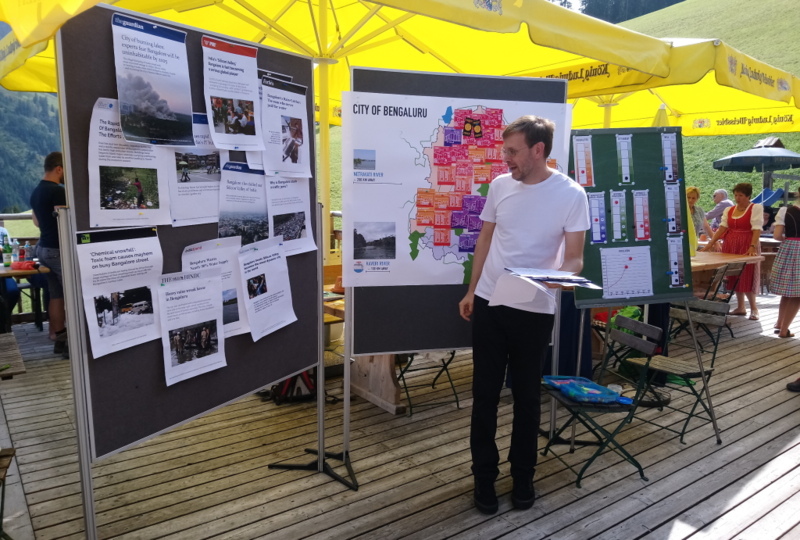 Many participants of the Alpbach experience hadn’t heard about the Bengaluru’s situation before. They were shocked to hear that the “game” they “played” is in fact rooted in real data, and that the problems they were trying to address may soon lead India’s Silicon Valley to destruction. The Bengaluru Quest enabled them to immerse in this reality for 60 dreadful minutes and draw valuable conclusions. Social simulations throw participants in at the deep end to let them experience the complexity behind many global problems. On the picture: Nexus Game, another great example of social simulation. The Bengaluru Quest is thus an environment for exploring behavioral, social and institutional challenges connected with sustainability transformation. By painful yet thought-provoking confrontation with a real-world case, participants may face a complex, ambiguous, and uncertain reality of modern policy making. The interactive and dynamic character of this process can lead to a deeper understanding and insights of a universal relevance. What can we do differently to avoid similar mistakes? How to ensure more safe and sustainable future for all? What is my individual responsibility in this process? These are all questions that emerged during a short session in the Austrian Alps.